Strong online performance is about giving visitors the best possible experience on your Alliston website. An eye-catching homepage design and seamless layout tip the odds in your favour of winning new customers. If you are thinking about a refresh, then consider NetGain for your next web project. Our graphic designers keep in tune with the latest trends in web design. You’ll generate more new sales and see more returning customers when you deliver a fresh digital experience. Your website is the first interaction people have with your business. When visitors are evaluating your company online, you only have a few seconds to convince them. That’s why web design is so important, since it can directly impact a company’s bottom line. Your Alliston website needs to be modern, attractive, and effective. If it has been awhile since your last redesign, then its time to refresh your online presence! Let NetGain’s graphic artists create a new experience for your users. Our custom business websites are designed to convert visitors into paying customers. Let’s get started, call us at (705) 797-2455. In a perfect world, you wouldn’t need search engine optimization (SEO). But the reality is, your competitors are all scrambling for the top spot in Google’s search engine rankings. The best way to beat them is by producing a high-performing site. Unfortunately, there are dozens, if not hundreds, of factors influencing your ranking in search engine results. Staying on top of all of them is a challenge. That’s why local businesses outsource SEO services to NetGain. Our SEO team lives and breathes web optimization. We use industry-approved techniques to improve your online visibility so you can attract new customers. “Design” and “development” seem similar but have different functions. Unfortunately, many design agencies cut corners on development because they don’t have the technical experience required to do a proper job. This is evident in clunky WordPress plugins that cause slow loading times and choppy navigation. However, NetGain’s is different since our core strength has always been technical programming. We are a custom developer with strong coding background. In fact, we are often called in by reputable design agencies to help troubleshoot technical issues. Count on NetGain for your most challenging project. 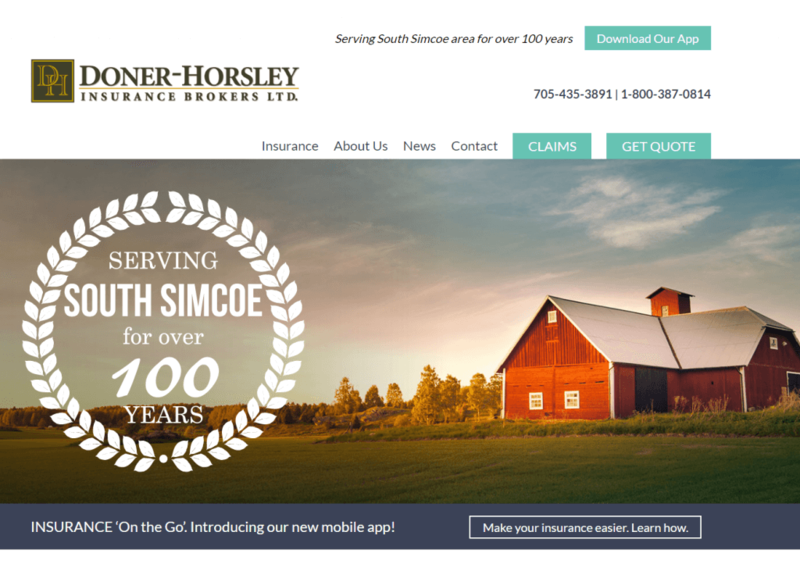 When Doner-Horsley Insurance Brokers needed to refresh their website, they weren’t interested in a mere cosmetic upgrade. They wanted a new website that encouraged visitors into becoming paying customers. NetGain met the challenge by designing a memorable site with persuasive conversion principles. We produced a fast-loading, mobile-friendly site. We encorporated strong calls-to-action, click-to-call functionality, and easy-to-fill contact forms. Since testimonials, from satisfied clients, are a powerful motivator, we included social proof on their homepage. We also added trust badges, highlighting their local and industry associations. Our “sticky” navigation menu ensures visitors have immediate access to contact details regardless how far they scroll down the page. These individual elements combine to produce a user-friendly, high-performing site. Realizing quality web content is a significant ranking factor, the folks at Doner-Horsley took advantage of NetGain’s copywriting services. We focused on adding value through compelling written content. This approach allowed our client to concentrate on providing stellar service to their own clients, while NetGain handled the writing duties. The resulting web pages are engaging and informative. Our high quality pages increase dwell time and improve conversions. Even if your current website is mobile responsive, is it truly mobile friendly? For example, does your homepage load in less than 3 seconds? (Test it on Google PageSpeed Insights). Also, can users quickly find the content they are seeking? The fact is, mobile users have come to expect a higher standard. As a result, they will abandon your Alliston website if it does not meet their expectations. As a progressive web development agency, NetGain designs from a “mobile first” perspective. If you’re contemplating a redesign, contact us for a free consultation. We’re eager to get started and build a site that looks terrific on a smartphone and tablet. “Set it and forget it” is not a proactive strategy when it comes to maintaining your marketing website. Why? One reason is security plugins need regular updating. By ignoring your security settings, your protection will quickly be out-of-date. This leaves you vulnerable to being hacked. Secondly, Google algorithms change and the back-end of your site should comply with any new guidelines. Finally, a neglected site grows stale and Google is less interested in indexing an inactive website. Not surprisingly, this isn’t great for local search rankings. With a website maintenance plan from NetGain, we will actively manage your web property to ensure peak performance. Our maintenance packages fit any budget. Contact our team to learn more. We’re not your average website builders. In fact, web design is only a small fraction of the digital marketing services we provide. By partnering with NetGain, you’ll take advantage of all the additional magic we can do to promote your brand online. Work with our team of award-winning web designers, experienced developers, and dedicated project managers to create the perfect Alliston website. When you hire our multi-disciplinary team, you also get access to our best-in-class technology partners. Whether you require SEO services, eCommerce solutions or web design in Alliston, together we can build a powerful online presence. Modernize your website with a custom design from NetGain’s talented graphic artists and developers. Does your homepage load in under 3 seconds? It should. Ask our experts to optimize your Alliston website. Show off your social side to potential customers with NetGain’s social media management service. Attract new leads with Google Ads pay-per-click advertising. We create successful ad campaigns with measurable results. Sell your products services beyond Alliston with a secure online store. Ask us how. NetGain develops web apps that people enjoy using. With your idea and our programming, let’s create the next killer app. We’re proud to collaborate with Alliston’s business community on web design projects. To discover how we can help, just send us a note or pick up the phone and give us a call at 705-797-2455. We’ll be pleased to discuss your project.